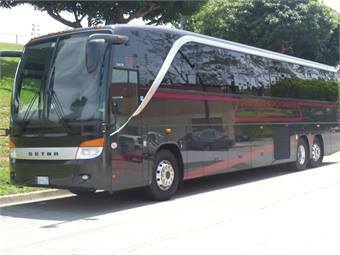 Los Angeles-based Corporate Coach Charter & Tours added a new Setra Top Class S 417 from Motor Coach Industries (MCI). The German-made Setra features premium seating with three-point passenger seat belts, wood grain accents, mini-fridge and Top Sky glass roof. The Setra S 417 fits in with the company's image and high standards for performance and safety. It has a superior suspension system for a smooth, quiet ride, and its front collision guard, cornering lights and rain/light sensors are just a few of the model’s safety features. 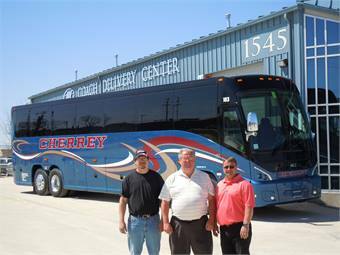 Additionally, MCI delivered one J4500 each to Abilene, Texas-based Bilbrey Tours and Listowel, Ontario-based Cherrey Bus Lines. The 2013 J4500 is one of two coaches in the Bilbrey fleet, joining an MCI E4500. The new J4500 has a clean-diesel Cummins engine, three-point seat belts and a media hub for tour escorts, along with all the standard safety and performance features for which the best-selling model is known. Cherrey opted for an ECAS kneeling system as well as seat belts and 110-volt outlets for passengers; the company additionally has installed its own Wi-Fi and satellite tracking system, something it puts on all of its coaches. The company’s fleet presently numbers 22 coaches, all MCIs, as well as other vehicles. Cherrey purchased its first new MCI coach in 1976.